Alloy Artifacts Museum of Tool History "Exploring Ingenuity in Iron"
April 14, 2019. We've added a new way to search the index using keywords such as company names, tool types, or model numbers. Just enter your search terms in the form at the top of the home page and hit 'Search', and a new page will come up with a ranked list of matching links. The search is case-insensitive and will find partial matches, so you don't need to enter the full keyword, and to look for multiple words together you can join them with an underscore (e.g. duro_metal_products). Although we usually don't mention the coming of a new calendar year, 2019 brings several events that should be of interest to our readers. The first is that Cornwell Quality Tools has reached their 100th year milestone, and we'd like to offer them a big shout-out: Congratulations on your first century! Cornwell is the first of the modern tool-truck companies to reach the century mark, and we wish them continued success in the future. Cornwell has had many achievements during its long history, but we'd like to mention a couple from their early history: Cornwell was the first company to use alloy steels for substantially all of their production, beginning at their inception in 1919, and Cornwell was also the first company to make hot-forged sockets in the standard 1/2-drive configuration, starting around 1926. A second noteworthy event for 2019 is that the U.S. copyright laws will finally release another year of publications into the public domain. Beginning in 2019, works copyrighted in 1923 or earlier are now in the public domain. Why is this important to Alloy Artifacts? Readers familiar with the slice of history documented by this site know that many of the interesting developments in the tool industry occurred during the 1920s and 1930s. But until this year, anything published in 1923 or later was potentially still under copyright, under the absurdly long copyright period granted by U.S. laws. This meant that publications from 1923 on could not be presented as full text by Google Books, which has greatly hampered our ability to track developments in the tool industry. We hope that Google will act promptly to release materials published in 1923, and that each coming year will bring new resources for historical research. One final event will probably not be noted anywhere else except here at Alloy Artifacts, but we think it should be significant for our readers. May 31, 2019 marks the 100th anniversary of modern socket technology, based on the release of Blackhawk's heavy-duty interchangeable socket sets on that date in 1919. An example of one of these early sets can be seen as the Blackhawk No. 8 Socket Set, and our article on Blackhawk will provide lots of further information. Tool Sales Underway. The previously announced sale of our tool inventory is now underway. Please refer to the Tool Sale Announcement for details. Major Policy Change. Please see the new Announcements section for a major policy change regarding our Tool Inventory Policy. Alloy Artifacts is 10! September 2015 marks the tenth anniversary of the founding of the Alloy Artifacts website. From a modest beginning with three articles and ten or twenty photographs, the site has grown to offer more than 5,000 photographs of tools, with historical information for dozens of tool companies. Long-time readers may remember the "dark ages" before this site came online, when an internet search for a tool or tool company likely found nothing at all, or at best a mix of speculation and misinformation. Alloy Artifacts provides solid information in the form of photographs, references to printed material, public documents such as patents and trademarks, and (when possible) links to other online resources. Correcting the record. 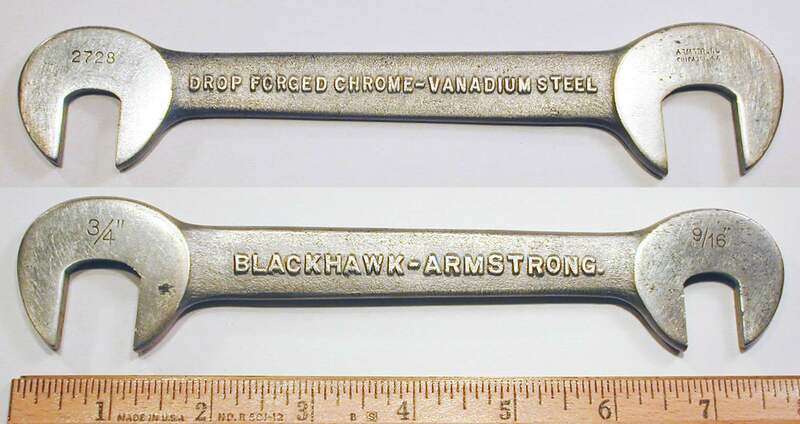 We've just moved the "Pick-Up" wrench to a new entry for New Britain Manufacturing, based on new evidence that this company was not affiliated with New Britain Machine. We've just found a long-sought example to associate a well-known maker with the Sears "AF" manufacturer's code ... see the Merit 6-Piece Wrench Set for details! As we roll into 2016, Alloy Artifacts would like wish all of our readers a happy and prosperous New Year. We're glad to have made some important improvements here during the last few months of 2015, and we hope to build on these changes in the coming year. Planned improvements include a more mobile-friendly layout, better indexing, and of course lots more tools. The old Comcast pages are now gone, and we would like to ask our readers to update any bookmarks or links that refer to the old Comcast address. If you maintain web pages that refer to this site, please make sure that your links point to our new address. Our new hosting site is working very well and all pages are now accessible at http://alloy-artifacts.org, with an alternate address at http://alloy-artifacts.com. We've taken advantage of the move to dust off our pages a bit -- fixing broken links and other bit-rot -- as well as adding a few minor updates. The new site will allow us to do some things that are not feasible with static pages, such as online surveys and generated pages. We hope to add some new features and content as time permits. 04/14/2019: Added index search facility, reworked navigation menus. 01/01/2019: Added welcome to 2019. 02/01/2016: Added H.D. Smith Company. 01/21/2016: Added C & G Wheel Puller. 01/18/2016: Added Cronk & Carrier. 01/03/2016: Moved changelog to scroll box. 11/21/2015: Redesigned home page, added photo slideshow. 11/09/2015: Added About page, minor edits. 10/22/2015: Revised and expanded Tool Industry Timeline now available. 10/20/2015: New site now fully functional. 10/06/2015: Moved to a new hosting site (in progress). 06/13/2011: Added a page for Bay State Tool. 03/10/2011: Added a page on alloy steels. 08/06/2010: Added a page for Syracuse Wrench. 10/16/2009: Switched to new version of site index. 10/10/2009: Added link to manufacturer index. 10/08/2009: Added photo sampler to home page. 10/06/2009: New index version (beta) now available. 10/04/2009: Started adding Google search box to pages. 09/30/2009: Moved site back to home.comcast.net/~alloy-artifacts, added FAQ page. 08/28/2009: Moved Wilde Tool to separate page. 01/28/2009: Added a page for Thorsen Tools. 03/24/2008: Added table of Patented Tools. 02/14/2008: Added a page for Sherman-Klove. 11/01/2007: Added a page for Bridgeport Hardware (BHM). 10/27/2007: We've moved! New site address is Alloy-Artifacts.com. 06/24/2007: Added a page for Pexto. 04/14/2007: Added a page for Wright Tool and Forge. 03/06/2007: Added a page for Champion DeArment. 03/05/2007: Added a page for J.P. Danielson. 02/19/2007: Added a page for Cornwell. 01/16/2007: Added a page for Crescent Tool. 12/11/2006: Added table of Recent Additions. 09/23/2006: Linked article on Armstrong, added brief notes on Bog and Milwaukee Tool & Forge. 09/13/2006: Linked articles on Billings, Walden, and Williams, currently under construction. 08/17/2006: Linked articles on Bonney and Herbrand, currently under construction. 06/10/2006: Loc-Rite 23336 flare-box wrench added as Tool of the Week. 05/09/2006: Added a brief article on Husky Wrench. 04/27/2006: S-K Model 4270 ratchet added as Tool of the Week. 03/20/2006: Herbrand 6827 Flex-Box wrench added as Tool of the Week. 02/27/2006: Preliminary page for Blackhawk Manufacturing added, under construction. 02/14/2006: Duro-Chrome 699 ratchet (forerunner to Williams S-52) added as Tool of the Week. 02/12/2006: Update to Craftsman page, comparison with Husky breaker bar. 02/08/2006: Update to Snap-On page for early socket patent. 02/05/2006: Swagelok Roller Cam wrench added as TOTW, updates to Plomb Tool page, index updates. 01/29/2006: Vlchek Tool page now pretty much complete, check it out! New TOTW and Site Index updates as well. 01/25/2006: Added Site Index to bottom of page, should help with finding entries. 01/24/2006: New TOTW, patent updates, improvements to Vlchek page. 01/16/2006: Added preliminary page for Vlchek, still under construction. 01/07/2006: New TOTW, updated trademark page. 12/18/2005: New TOTW, updates to Duro-Indestro and S-K pages. 11/20/2005: Updates to Craftsman, Hinsdale, and S-K pages; update to timeline table; improved navigation. 10/30/2005: Added page for Sherman-Klove (S-K) Knurled-Base sockets. 10/22/2005: Updated patents table; added preliminary page for Hinsdale. 10/18/2005: Changed page layout, and added the "Tool of the Week" feature. 10/13/2005: Preliminary page for Plomb Tool history.